This is another great place with lots of kids activities which should keep them occupied for hours. I went fairly recently with my family as Grandma and Grandad had taken my daughter a month earlier and she couldn't wait to go back. .........which we didn't get to do as we'd run out of time - I'd thought three hours would have been more than enough! I'd recommend you take a towel and a change of clothes for your kids as they're likely to get very wet! 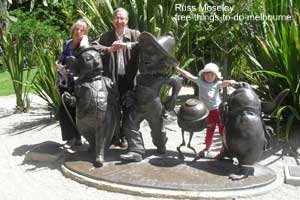 You'll find the Childrens Gardens in the Royal Botanic Gardens. Go in the top gate by the Observatory buildings (near the Shrine of Remembrance), walk down the path on the right hand side of the cafe for about 100 metres and you'll find it on the right hand side. 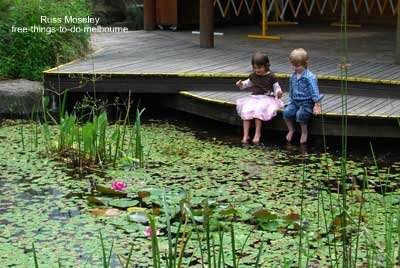 .........It's open 10am-Sunset Wed - Sun (Mon/Tues it's booked for school groups in term times), 10am-Sunset daily during Victorian State School holidays, 10am-Sunset all public holidays. The gardens are closed for 8 weeks every winter. Check out the map below for it's location in Melbourne. Click on the blue writing beneath the map for a better view.